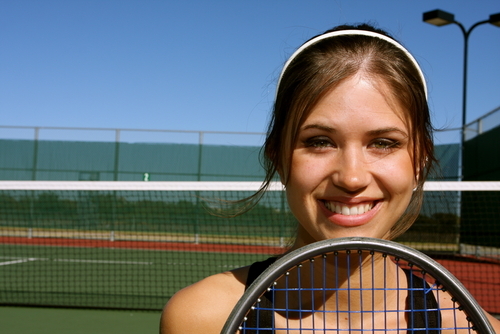 Playing tennis is a great way to stay in shape, but it can also be frustrating if you tend to commit the same mistakes when it comes to your tennis strokes. Mistakes happen often and it is best that these should be remedied. If you find yourself hitting the forehand too long, here are some suggestions to help you improve your forehand. Your wrist may be turning your racket upward just before the ball hits it. Try grabbing the handle more tightly as you start your swing, thus keeping your wrist from turning. Make sure to tilt the face of your racket down more while doing a backswing. The racket face would then tilt upward naturally as you swing forward. By tilting the face of your racket somewhat downward as you backswing, the face would then end up at vertical as it meets the ball. Your racket head is probably drooping below your hand as the point of contact, thus forcing the ball to bounce way off. The long axis of your racket should be horizontal as the ball hits the racket’s face. Brush up the back of the ball as you swing, making the ball fall faster as it flies forward. If you are right-handed, try rotating your grip a bit clockwise. This gives you a Western grip, making your racket face tilt upward later in your swing, thus generating more topspin. If you are using a Continental grip, try rotating your grip at least 45 degrees clockwise until you reach an Eastern forehand grip. Some of today’s players tend to put their weight in their back foot as they swing; it is still advisable to hit the ball while shifting the body weight on the front foot. This means that you are hitting the ball too early, causing your racket to tilt up too far. Try delaying your swing a bit and meet the ball slightly farther back. Often called slice, backspins-which is achieved by brushing down the back of the ball-are useful in keeping the ball float farther in the air. However, it is more difficult to keep powerful shots in using a backspin. To solve this, try a more forward swing and less of the downward brush as you hit the ball. This creates less backspin and less floating. Try playing with a racket that has tighter strings or a smaller string bed. If you are a hard-hitter, having an oversized or very loosely strung racket is more of a disadvantage.